ACTS law hour - Episode 4 - ACTS Law Firm in California | Abir Cohen Treyzon Salo, LLP. Announcer: You’re listening to the Acts Law Hour on 790 KABC. The attorneys from Acts Law are here to help you restore your property, your pocket-book, and your sanity. Don’t delay. Act now, at 800-222-5222. Lorraine Ladd: Good afternoon Los Angeles. This is Talk Radio 790 KABC. 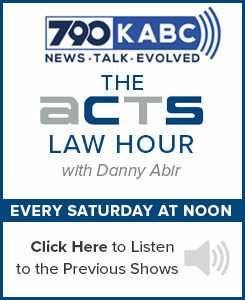 Welcome to the Acts Law hour, heard every Saturday at noon, providing you with solid information from our good friends At Abir, Cohen, Treyzon, and Salo, the Acts Law Firm. That’s Acts Law. Find them at A-C-T-S-Law.com. Knowledge is power, and power is knowledge. This is the Acts Law Hour. We want to empower you today. Now, here’s your host and managing partner of the Acts Law Firm, Danny Abir, along with me, Lorraine Ladd. Danny Abir: Good morning Lorraine. How are you? Lorraine: Good morning. I’m good, how are you? Lorraine: Did you have a good week? Danny: Lots of work, very busy. Danny: But can’t complain today, it’s Saturday. Lorraine: I know, and it’s a beautiful day. Danny: Beautiful day. Absolutely. It’s funny, I was walking in and I realized how perfect day. Not too hot, not too cold. It’s just the perfect day to go out for a walk. Lorraine: 70 degrees in LA. That’s great. Another good thing, we get an extra hour. Lorraine: Daylight savings time. Spring forward, fall back, we get an extra hour of sleep. Danny: For me, it’s actually not going to be that way. I have six-year-old twins and a dog who tend to get up at 5:30 in the morning. Lorraine: So it takes a while for their clock to readjust. Danny: Yes. This is full in a way if you really think about it. If the dog keeps waking up exactly at five o’clock in the morning, maybe you’ll get an extra hour or so to sleep. Danny: Welcome to the show. My partner, Alexander Cohen. How are you? Alexander Cohen: I am doing fantastic, Danny. How about yourself? Danny: I am good. I didn’t see you all week last week. Alexander: That’s because I’ve been cooped up in my office, working for our amazing clients and battling the battle that I battle every day with the insurance companies. That’s what we do. Lorraine: Okay. You, Alex, are insurance claims and bad faith, correct? Alexander: Absolutely. That’s my passion. That’s where the passion lies, and that’s why I’m here, to talk with the beautiful audience and the listeners of KABC 790-AM. Lorraine: Yes. All right, love it. Alexander: I love being here, you know that. Danny: What’s the game tonight? Lorraine: Tonight, isn’t USA playing tonight? Danny: Yes, I think today is homecoming. Danny:– We’ll take Alex to the USA game. Danny: That was a good game. Alexander: – they had a fantastic victory. Danny: That was a very good game. Alexander: It was just awesome to see that they’re jelling along and just it gives me a boost of energy just to watch them. Danny: Yes, Russell. I mean Russell Williams. Danny: D’Angelo Russell. Sorry. He came to — There’s a D’Angelo Williams, but he is a football player. He came to show and say this is what you missed. Alexander: That was the show last night. Alexander: It’s what you guys missed. Danny: It’s been a crazy week, as far as the law is concerned. Lorraine: Yes. It’s almost like you’re afraid to turn on the TV, right? Because you don’t know who’s going to be the next one that’s being talked about and being accused for sexual assault or sexual abuse. It’s really crazy, crazy times. Danny: Right. These are shows. This is — What’s it? The Kevin Spacey show? Lorraine: Oh my gosh, House of Cards. Danny: House of Cards. That’s a show that a lot of people love. Lorraine: Right. They halted the production of it It. Alexander: Yes, there’s a lot of disappointed people right now about the show being canceled on Netflix. It is what it is. I’m actually glad everything is coming out into the open, I think it needs to happen. Alexander: It’ll bring cultural awareness, it’ll bring awareness as a whole. This industry has had this unfortunate event going on for quite a long time, and now people are gaining the courage to come out, and I applaud them. I really, really, really applaud them. Alexander: It’s necessary, it’s required for closure, for psychology purposes, is absolutely necessary. It affects your future, it affects future generations. It needs to happen. I’m glad everything is coming out to the surface. Danny: It’s funny, Doug and I were talking about abuse cases last week. One of the things I do get asked a lot is, aside from the fact there’s a lawsuit, why is it that people come forward after years and years and years, and it’s exactly what you said, it’s closure. It’s something that they coop up inside there and it just stays there and eats up at them and they feel like they were wronged, rightfully. Danny: Until somebody actually hears them, they feel that violation continuing until people acknowledge and then realize yes, somebody did you wrong. Alexander: Absolutely. Coming from a psychology background myself, I have a degree in psychology, I can completely understand that this is something that gets cooped up inside your psyche, your mind, and it will affect you emotionally, physically, psychologically and every which way that you can imagine. It’s necessary to be talked about. Again, it will bring closure. It needs it, there needs to be some finality in people’s lives. The more people come out — and social media is helping. Alexander: Because in the past, if you articulated what you were feeling inside, who would hear it? Now with the help of social media; Twitter, Facebook, Instagram, you name it, you will reach millions and millions of people at the same time. Lorraine: Yes. They have that hashtag me too and, oh my gosh, there was millions of people, even myself being on Facebook, friends of mine. I was like, “Oh my gosh.” I had no idea. Danny: Internationally, this is not just an issue in the United States. This is across the world. These hashtags were coming across in all different countries. Some countries that you would expect and some countries that you would never even expect. It’s very common, sadly. It’s one of the cases we picked up as far as abuse is concerned the past week, is someone who has been abused in the past, and in the past when she had brought it up, she was attacked for it, because they were saying, “You’re at fault. You’re the one who caused it”, and it happened again by somebody else. did you decide not to file a report. She said, “I don’t want to be pointed at again saying you are at fault. I just wanted to make sure that the police know that this has happened, so it doesn’t happen to somebody else but they keep — I don’t want to go through that ordeal again.” Until people realize what the issue is, until it’s dealt with, unfortunately, it’s just going to keep on repeating. Alexander: Well, I think there’s a lot of fear of people wanting to come forward. That’s probably the number one component. Danny: The social stigma that stands out. Lorraine: Yes, because you accuse the person who did this to you, and then all of a sudden you’re the one in the hot seat, and they’re looking into your background, and they’re looking into everything you’ve done. All of the sudden, if anything you’ve done that may be a little bit questionable, even though it had nothing to do with the event that you’re the victim of that you’re reporting, all of the sudden, you’re in the hot seat, and they’re taking you and they’re tearing you and your character, and when you do your pardon, it’s like, who wants to go through that. Alexander: Right. You have to be willing to withstand that type of pressure. It takes a lot of courage. I applaud everybody that has that has so willingly agreed to come out and step into that limelight. It’s very difficult. I applaud your advisor’s courage for doing that, and other men are coming out. Another factor is, I think a lot of people are afraid that it might financially harm them. Alexander: For that reason, they’d rather not address it because it affects their economic status, so you have to be careful. Lorraine: Yes, it’ll come out eventually. That’s what we’re saying, right? At some point, something will trigger, and whether it’s somebody else coming out and you see it on the news or whatever it is. But, it seems to me like, you have the psychology background, but at some point, it’s going to come out for most people. Alexander: I hope sooner than later for their own sakes and for the sake of future generations, I hope it does come out. Now you’re seeing the men come out. Before, you would think that this is just geared for a woman being sexually abused. But now you’re hearing all the men that have been sexually abused and now they’re coming out, which is interesting. I’ve known that this happens all the time with the — I’m just so happy that that’s also coming out into the open. Lorraine: Corey Feldman, Corey Haim. Danny: – Corey Haim. With Harvey Weinstein, it was the actress of — What’s her name? I’m drawing a blank. But there’s actually a well known actress who actually came up and said that she was 17 when this happened too, and then the same thing happened with regards to Kevin Spacey. Well, in the next segment, we’re going to be talking about insurance, which is a subject near and dear to Alex’s heart, so tune in. Lorraine: Yes, we’re going to take a quick break and when we come back, we will continue our conversation with Alex, and you’re listening to the Acts Law Hour. That’s A-C-T-S Law. Go ahead and give us a call, we’d love to hear from you. 1-800-222-5222, and you’re listening to Talk Radio 790 KABC. Lorraine: This is Talk Radio 790 KABC, welcome back to the Acts Law Hour, heard every Saturday afternoon, providing you with solid information from our good friends at Acts Law Firm, that’s A-C-T-S Law. You can find him them at actslaw.com. If you have any questions or you’re looking for any advice, go ahead and give us a call, we’d love to hear from you. 800-222-5222. I’m Lorraine Ladd, along with our host, Danny Abir, and we’ve got Alex Cohen in here, and he is here to talk about insurance claims and bad faith. Danny: Okay, just to redeem myself, because Alex was looking at me funny in there when I couldn’t remember her name and I never forget a name, especially when it comes to this. It was Kate Beckinsale. Alexander: Yes, you never forget a name. Danny: No. Actually, the firm’s Facebook page got a couple of hits saying, “You mean Kate Beckinsale.” Yes. Danny: Anyway, that was the actress I was talking about when she was 17 and I saved them. Alexander: You have redeemed yourself. Danny: Let’s go to insurance, because I know Alex is itching to talk about insurance and it’s always a subject that he loves. Alexander: I’m on the edge of my seat. Danny: At the edge of your seat. Here we go, let’s talk about types of property claims that generally people can think about that they’ll have a claim as far as damage is concerned. Let’s talk about different instances that we’ve dealt with at the office. Alexander: Okay. Well, the types of properties that we represent policyholders on are residential and condominium type of claims, commercial properties, whether it be shopping centers, high rises, manufacturing plants, warehouses. Generally, people who own real estate and assets are our potential clients, and these are assets that are generally insured by property damage coverage and fire losses and liability. Those are the type of properties that we aim to protect. Lorraine: Now, if you own a home, don’t you have to have insurance? Alexander: You do, if you have a mortgage on your property. The banks do require you to carry insurance, and if you don’t, they will place a force-placed insurance on your house because the asset belongs to the bank until you finally pay it off and you get the deed of trust. If you choose not to have insurance, that’s a choice. It’s a poor choice because damages can be so significant and substantial. Danny: Well, it’s actually very understandable. Now, put it in medical terms. Imagine somebody has a toothache and they go to a GP, a doctor who’s a GP, but the doctor is a GP just generally knows the body, but a dentist knows how to deal with teeth, and optometrists or somebody with a specialty in eye or someone who’s a podiatrist, specialty in the feet, that is something that is a specialty. There aren’t many attorneys who know how to handle insurance claims. There are very, very few actually who handle bad faith. That’s why it makes a difference to go to someone who has a specialty versus someone who is a GP or a general practictioner. Lorraine: That’s a great point. Exactly, because you don’t know what you don’t know. Alexander: Correct, and I’ve got to tell you, there are a lot of great attorneys, but this is not for everybody. If someone came to me and said, “Can you draft me a will and trust?” No, I wouldn’t be able to– I wouldn’t know one end of a will and trust to the other, that’s just not what I do. But when you come to our firm, and you have an issue with your assets and you’re seeking representation, against your own insurance company, for a property damage claim, yes, that is our specialty, we understand it, we live it, we eat it, we breathe it on a daily basis. Lorraine: I just recently had a friend who said that they had water damage in their house, and the insurance company came in and they fixed the floor, they fixed everything, but they didn’t fix the pipe underneath, and that’s not covered, is that true? Alexander: This is one of the reasons why — Now, to side with the insurance companies, their policy is what their policy is. They’re not there to insure your pipes that are damaged from wear and tear. However, when the pipe bursts, what happens is, they allow — the policy allows to get compensated for what’s called the ensuing loss. Initially, water damage itself is not covered, unless it comes from a sudden and accidental event, like your friend’s case. It came from a ruptured pipe. What the insurance company doesn’t cover is the repair and replacement of the pipe. They’re not there to warranty your pipes. What the give back to that is the ensuing loss, so the ensuing losses of the damages that the water causes to your property, and that’s what your friend experienced. Danny: The same thing goes to mold, basically, or mold that is caused as a result of the ensuing event. You may have a limit as far as your mold — basically, mold damage is concerned and clean up. However, if the event is covered, then the ensuing mold damage would be covered as well. Alexander: Sure. Mold became a very big topic during, if you remember the big man era. Alexander: Okay. It blew up. Danny: Lorraine is only 18. Lorraine: I’m too young, what do you mean? Alexander: Mold is an environmental issue. Mold occurs generally between 24 and 48 hours or 72 hours when water damage is not extracted, the water is not extracted and the property is not dried down. As part of what a homeowner needs to do, even before calling out their insurance company, they’ve got to do something to mitigate their damages, whether it be to mop up the excess water that came out of a pipe, shutting off the water from the main or from the source of it, getting a plumber to mitigate your damages. Lorraine: Right. Putting these big blowers. I see a lot of people putting those big blowers. Alexander: That’s a different story. That belongs to what’s called an EMS company, an Emergency Mitigation Service company that are specialists in that particular area, and they come and their staff is well-trained. They’ll come and they will put dehumidifiers and fans, and there’s a whole technique and art to this. Lorraine: Is that eliminate some of the mold? Alexander: It doesn’t eliminate the mold. What it does is, it’ll dry the structure down. Alexander: The intent of it is to dry the structure as best as they can, and oftentimes, you won’t be able to do that. You will bring the moisture level down to some degree, but it’s not below the standard that is required by by code. Then that’s when you see dry walls being cut out, warped and buckled floors being taken out in order to dry the structure, in order to prevent further damages to your property. Lorraine: Okay, that makes sense. You’re listening to the ACTS Law Hour, that’s a A-C-T-S LAW. You can find them at actslaw.com. If you have any questions, we’re talking about insurance claims and bad faith, give us a call at 800-222-5222, we’d love to help you with any questions or advice you have. Danny: Okay. You talked about buckling of the [unintelligible 00:22:10] floor. Danny: Let’s talk about different types of damages that could possibly, or different types of events that may give rise to damage to property. Here in California, one of the things that we have to always be afraid of is fire damage. Danny: One thing that most people don’t realize is that it’s not just the damage from fire that they have to be aware of and be afraid of, it’s also smoke damage that could also damage their properties. Alexander: Correct. Fire is always an interesting situation. First of all, the insurance policy that you hire, that you obtain, they’re all fire insurance policies, first of all. They’re all standard fire insurance. Danny: Because the bank doesn’t want to lose its asset base. Alexander: Well, yes, and then the other aspects of it that a fire insurance policy provides for you are, for example, they provide theft and burglary losses. Losses occurring from vandalism, losses occurring from, like what Danny said, smoke. But talking about fire, when a fire occurs, when the fire department or anyone puts out the fire, they normally use why their fire retardants or water, and it actually damages your house even at a greater degree. Now you have fire damage, smoke damage and now on top of this, you have added water damage to your property. Fire damage claims are extremely difficult, extremely difficult to handle, they have a lot of different moving parts and components to it. Lorraine: Are you covered for all that? Lorraine: Okay, fire, water damage. Okay. Alexander: Fire, water, and all that. On a standard fire insurance policy, you will get your fire losses covered, water damages will be covered from sudden and accidental events, not something that is a long-term event, but something that is a sudden and accidental fortuitous event that happens. You will get theft and burglary cases covered, and vandalism covered. These are just some of the areas that a fire insurance policy covers. Danny: Well, there’s plenty of more to discuss with regards to the different types of damages, and we can give some more examples. Also one of my friends called me on my drive here and said he had a question for you. He asked me — He’s a little bashful to come under radio. Alexander: Oh, I dare him to call. Danny: He said — He has a French accent, so actually it would have been probably good for him to call the radio. But he said, “Can you ask Alex a couple of questions about my claim?” We’re going to be talking about that. Everybody better listen when we come back from the commercials. For more information about the next upcoming food boot camp, contact the Keylight Counseling Center at 323-935-9712. The first five people to call and mention this ad will receive a 20% discount on the next boot camp. Call now at 323-935-9712. Lorraine: This is Talk Radio 790 KABC. Welcome back to the Acts Law Hour, heard every Saturday at noon. Providing you with solid information from our good friends at Acts Law firm, that’s A-C-T-S Law.com. Find them at actslaw.com. If you have any questions, we would love to hear from you. We’re talking with Alex Cohen about insurance claims and bad faith. I’m Lorraine Ladd, and here he is our host, Danny Abir. Danny: Okay, we were talking about the different types of damage that could be covered by insurance. Let’s talk about my friend’s case because I just texted him and he said he’s still too bashful to come on the radio for some reason, I don’t know why. We don’t bite. But he said that what happened was, he found out he got a call from DWP, that all of a sudden there’s a ton of water usage in his house, so there’s got to be a pipe burst. They go, and below the house, there was a pipe burst with hot water. The steam has now damaged all the hardwood floor in his house. He’s wondering whether this would be a covered event, and wanted to know more about it. Alexander: I’ve had probably a ton of cases like this in the past. California homes have California basements and a lot of water heaters are located in a basement. When a pipe burst from a water heaters, especially a hot water heater line, it can create tremendous damages. One, if the water directly hits and shoots upward and hits the underlayment of the floor, it’s very difficult to dry that. What will happen is, as it dries, the wood will shrink and expand. It will cause buckling to the wood or cupping. That’s what will occur. Depending on the type of wood floors that they may have. That’s a direct physical damage if water directly hits it. There’s another way that the damage can be caused. It can be caused by the moisture and the steam that is created in the California basements. The hot water line creates steam and then that in turn is moisture. The moisture will naturally cause that. That’s another way that it will happen. It may not have a direct impact, but the moisture and steam will cause that. I had this happen in a Beverly Hills home where the exact identical thing happened to your friend, Danny. Their hardwood floors ran throughout this gorgeous Beverly Hills custom-made home. We took a look at it and it was impossible to dry, though the wood damage had the flooring had already been compromised. The wood flooring had to be pulled up and now try to match the new wood to existing wood. Lorraine: To the old wood, right. Never going to happen. Alexander: It’s not going to happen. Alexander: It’s very rare that you can have that that will actually occur. But especially if you have like gorgeous hardwood floors from the path and you’re trying to match it with new hardwood floor, good luck. In other words. The wood floors had to be lifted throughout the entire house. Again, this was a gorgeous two-story house up this staircase. It went into the kitchen, and all the kitchen cabinetry were sitting in on the hardwood floors. They had to be pulled because you’re not going to leave hardwood floors under your kitchen cabinetry. No, you can’t do that. That had to be removed and that turned out to be like a six, seven hundred thousand dollar claim. Lorraine: Now, was the insurance company willing to pay that right upfront or did they have to go to you to get it done? Alexander: They had to go through an attorney to get that done. Because initially I think the payments that they wanted to make was well, according to the policy, we only are responsible for the direct physical damage. The direct physical damage was no more than 50 square feet or a hundred square feet, something like that. They’re like, well, this is all we have to pay. But when an attorney who knows his craft and trade and understands how to bring in regulations, insurance regulations that tie in, these policies, like I said, they talk about direct physical damage, but then, when you bring in a regulation that talks about no, you have to pay for what’s called the reasonable uniform appearance. If this house loses its uniformity and its appearance, it’s not the same thing anymore. You can’t just patch up the wood and say, you’re good to go. No. Lorraine: Right. You get into like the value is that why because the value of this house, it needs to go back to the value of the house before the damage happened? Alexander: Not the value of the house, but you have to bring the house to what it’s called its pre-loss condition. Pre-loss condition. It does affect value if you don’t bring it to its pre-loss condition. Danny: You imagine if it’s patchwork, there’s a part of the house that’s done and a part of the house that’s not done. It doesn’t look the same. That makes the difference. Alexander: Correct. Imagine now this homeowner wants to go sell his property now. They’re going to have to disclose this loss that occurred. If a savvy buyer comes and sees hey, why is that wood over there patched up? If the buyer now wants to negotiate with the seller, they’ll negotiate a lower purchase price because they would be obligated to fix this. Eventually, it’s coming out of the pocket of the homeowner anyway. That’s why these policies are called indemnification contracts. They’re supposed to indemnify you for the loss. You can get the money, fix the house so that you don’t sustain that depreciation and loss when you come to sell your house, as a form of example. Danny: This is not just an example. This is not just something that happens in Beverly Hills or in Newport Beach, or something, it happens in every single area with us in the San Fernando Valley. It’s in Santa Monica. It’s in Orange county, it doesn’t matter. Alexander: No, it doesn’t matter. Danny: Yes. There is a conflict of interest there because they’re there to make money. The way they make money is yes, they take your premiums, but if you think about it, the premiums you pay even for four or five years will never be paying for an $800,000 claim. If they go and pay what they’re supposed to pay on every loss, their profits are not going to be what it is over there. That’s something that people have to remember, that this is while this is their insurance company, they never go to lunch with them, they’re not their buddies, it’s not a friend, it’s a for-profit business and a lot of profit business. They have to consider that when they’re looking at their loss and saying, this is my insurance company but they’re not there to make me whole. They’re supposed to make me whole according to regulations, according to the insurance contract that I have. Lorraine: Basically, insurance companies are banking on the fact that they’re not going to have claims. Danny: They hope that — They know they’ll have claims. They’re hoping that they are not going to have to pay on the claim. The different ways they come up with the different arguments they have is well, this is not covered, or this is — For example, we’ll go on into a couple of examples. The word they say okay, the damage is X and the damage is really X times 10 or 20, or they delay it so much and throughout this delay, they’re going to basically tell you throughout this delay, they keep dragging it and dragging it and dragging it and they’re making money on your money. A lot of times, homeowners and the insured get cold heart. They walk away and they don’t want to fight it and they don’t think about it. Lorraine: Because they just get frustrated and like, I’m done. Danny: Yes, they get frustrated. Lorraine: Yes. I’m done. I want my house done. I’ll just do it myself. Alexander: There’s a lot of people that I’ve experienced have fear in even filing a claim. They don’t want to rock the boat with their insurance companies is what I’ve heard from a lot of people. Alexander: Plus, they don’t know how to navigate their way through an insurance claim. It is very frustrating when you don’t have the know-how or even if you have the know-how, but you don’t have the time. That’s a big element. I service a lot of professionals, doctors, lawyers, accountants, you name it. They’re not going to have the necessary time to spend on handling an insurance claim. It’s better outsourced to somebody that can handle it quicker, faster, they know the policies, know regulations, construction law. Knowing what experts to bring at what time and when is critical. Lorraine: Now, has it been your experience? Are they, I don’t know if the right word is allowed, but do they often get dropped by their insurance after they have a big claim like that? Alexander: It’s a great question. A lot of people — That’s another fear that people have. Like if I file a claim, I’m going to get punished by my insurance company or my rates are going to go up or I’m going to get dropped. It’s not quite like that. Just because you file a claim doesn’t automatically mean that your rates are going to increase. It doesn’t mean that the carrier is going to drop you. It is going to go on the record that you have filed a claim. I always let people know, don’t just file a claim. Let someone professional investigate your claim to see if, a, there is a claim to file, number one, and if it is something, if that particular incident is a covered peril under your policy or not. Then, if it is and the value is there, that’s when you file a claim. Lorraine: Okay. That makes sense. Danny: When we come back from our break, we are going to be talking about a couple of different examples of cases that I know we had in the office. Where the insurance companies, for example, one of them, the insurance company’s offer was $17,000 and it ended up being a $250,000 claim. If you remember the beam that was there. Alexander: The fire damage, yes. Danny: Then there is flooring across the home where I remember we had a letter from the insurance company saying, how did a claim like this become a claim like this? We’re going to talk more about that when we come back. You’re listening to the A-C-T-S, Acts Law Hour. We’d love to have you. Call in if you have any questions. We will be discussing more about examples when we come back from our break. Lorraine: Perfect. We’ll take a quick break. I do want to ask you too about earthquake insurance. I know that a lot of people have questions about that too, so make sure you call us if you have any questions. 800-222-5222. We’re going to take a quick break like we said and when we come back, we will continue discussing with our guest lawyer, Alex Cohen. You’re listening to the Acts Law Hour with Danny Abir, and me, Lorraine Ladd, on talk radio 790 KABC. Are you a property owner dealing with damage to your home or business and getting the runaround from your insurance company? Is the insurance company’s assessment of the damage and payment on the claim ridiculous? Wondering if you have any recourse, the attorneys At Abir, Cohen, Treyzon and Salo are ready to help. If you have questions about property claims, civil rights, personal injury or need legal counsel, call the ACTS Law Firm, 833-ACTSLAW or go to actslaw.com. That’s A-C-T-S LAW.COM. Falling down the stairs and breaking your ankle doesn’t sound good. [background noise] But falling down the stairs and breaking your ankle with no health insurance sounds even worse. [background noise] Life can change in an instant, be covered when it does. At Covered California, we can help you get financial help to pay for your health plan, Covered California. It’s more than just health care, its life care. Visit coveredca.com today. Enroll by December 15th. Welcome back to the ACTS Law Hour, helping you stop insurance company abuse at 800-222-5222. Lorraine: This is Talk Radio 790 KABC, welcome back to the ACTS Law Hour, heard every Saturday at noon. Providing you with solid information from our good friends at A-C-T-S LAW. You can find them at actslaw.com. If you have any questions or you’re looking for any advice, go ahead and give us a call. That’s 800-222-5222. I’m Lorraine Ladd along with the host, Danny Abir. Danny: Okay. It sounds like we have a few lines lit up. Let’s talk to our callers and see what their questions are. Danny: This is Danny Abir, how can we help you? Caller: Yes. I have a question about California earthquake insurance. I just heard recently that they had either made the program better, more affordable or a better value and just wanted what you tell me about it? Danny: Sure, where are you calling from? Alexander: What have you heard exactly when you say they’ve made it better? I don’t know if I’ve necessarily heard that, but California insurance, California goes to the California earthquake Authority and the one thing that you guys need to know about earthquake coverage is it’s a separate policy that needs to be purchased. It doesn’t come automatically with your homeowners policy. It is a complete separate policy that you need to purchase, is in a different premium for that. They have a very high deductible, you choose the deductible that you’re comfortable with. But I’ve handled insurance claims that have had like $100,000 deductible. Some of them $50,000, $60,000 deductible. In other words, you’ve got to take a look at the declaration page on your earthquake coverage and determine what type of coverage do I have and do my earthquake damages exceed the deductible or not. I haven’t really heard anything about policies being made better. If they have, I need to understand what it is that you’re exactly talking about so I can comment on that. But the earthquake insurance has been earthquake insurance for as long as I know. Lorraine: Do you have earthquake insurance? Caller: We do not. I went to their California Earthquake Authority website yesterday and there’s a price calculator so that you can price in whatever level of deductible that you choose. There’s also many other options, whether you want coverage for masonry, repair, other such things and each option you add of course increases the premium. Alexander: Correct. He’s right, it’s an Ala Carte correct, he’s right because I’ve dealt with claims where, for example, it doesn’t cover certain things where under a normal policy you would think that these things would be covered. But a lot of people are risk averse in buying earthquake insurance and they always say it’ll never happen to me. But if you’re in California, listen we’re living in a state where earthquakes happen and if it’s something that you can afford, I would get it. It’ll make you sleep easier at night and earthquakes do happen and when they happen, boy, have I seen the damages that earthquakes cause. It’s horrific. Houses I’ve seen split, I’ve seen subsidence occur, so to put that house back into it’s pre-loss condition, it takes a lot. Earthquake insurance, I give it a thumbs-up. Lorraine: Okay, and about how much when you did that Ala Carte thing and you went through your insurance, about how much was it for the earthquake insurance? Caller: We were looking at premiums above a thousand a year. Alexander: That’s on the low end. I’ve seen policies go three, four, five, six thousand dollars even as far as that. If you can get something depends on the amount of coverage. Danny: Also depends on the deductible. Lorraine: Okay, perfect. Thank you so much for calling in and thanks for listening to the show. Lorraine: Okay. We’ve got, I think, Sydney on line two? Sidney: Hello, hi. Good subject, the insurance and claims and things like that. I just wanted to just make a couple of comments. It seems to me that sometimes we can redline ourselves if we just follow some too many basic claims that maybe not even work out to be worth even filing as sometimes I found that if you do a claim and you do maybe one, or two, or three over a three-year period, then they can cancel you. Because it’s so frequent. Alexander: Correct. 100%, you’re right. Danny: That’s absolutely is true Sydney, thank you for bringing this up. One of the things we actually do at the office is when people call. We check and see if the claim is worth even filing because a lot of times when we get calls at the office, we tell people no, this is not something worth filing. For example, you may have a $5,000 deductible and the damage is $7,000. You’re going to pay the 5,000 anyway. You might as well just pay the extra $2,000 and not file a claim because it’s going to affect you. Lorraine: Yes. Who knows what tomorrow could bring, right? Alexander: It all depends on your tolerance. 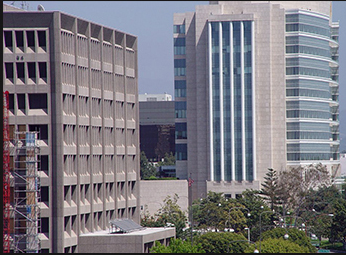 I’ve advised my clients and I advised the amazing listeners at KABC that before even filing the claim, let us evaluate your claim for you. Lorraine: That’s a great idea, right. Alexander: 100%. the evaluation is free of cost and we streamline the case. We know what questions to ask, we get to the bottom line really quick. We understand the cases. First of all, we’ve got to determine if there’s coverage and then when there’s covered, we can also determine what kind of damages has been sustained. A lot of times people we ask them to send us their photos and stuff like that or we can send an inspector to take a look at your house and that’s how our expense, not the policyholders expense. Danny: Lorraine, knowledge is power and power is knowledge. That makes a difference. Lorraine: Yes, that’s true. What are you going to say, Sidney? Sidney: There was one other thing I was going to mention, sometimes if you have an older car, and it’s your baby, and it’s beautiful and you have something done that happened to it. You may make a mistake by filing a claim if the value of the car is less than what it costs to fix it because then you may wind up losing your car because they wound up holding it, and then would have been a bad choice, that’s why it’s good to check with you guys too even on things like that. Lorraine: Yes, that’s great point. Sidney: [unintelligible 00:49:27] turned it out there too. Alexander: One of the important things that Sidney actually said and it’s important, people just file claims because they think they have to file that claim with the insurance company, and yes, if you file within a one-year period, three claims within a given time period like a one-year period, the insurance company will most likely drop you as a policyholder, that’s right. Then you want to talk about re-insureability in the future. Other insurance companies, remember I said, this goes into a database, so they will take a look at it and when they see that you file three claims within a single year, reinsuring your property would become much more difficult. Danny: Thank you Sydney for your call. Lorraine: Do we have anybody else on the line? Lorraine: Okay. Line three, I think it’s so. Is it? Danny: Hi, this Danny Abir. Welcome to the show. What’s your name? ?Speaker: They must have dropped. Charles: My name is Charles. Danny: Hi Charles, how’re you doing? Charles: I’m not doing so well. I had this very interesting scenario happened. I run an [unintelligible 00:50:34] City. I was actually about to shut it down and I had one last guest. The night before he was supposed to leave, I get — The morning he was supposed to leave, I get a text at 6:00 in the morning saying hey, get over here. Your places is flooded. I ran out there, like 15 minutes to get there. By the time I got there, he was gone ‘to work’. The plumber who stopped the leak has fixed the leak and it’s already gone and there’s a company already in there with 10 machines extracting water with humidifiers everywhere. Within five minutes, each talking to me about calling an insurance to take care of this, it’s not going to cost you one penny. Of course [unintelligible 00:51:24] everywhere, but I’m more concerned about my property because I just remodeled it anyway. The floors are buckling up, there’s water coming from the ceiling. I was contacted [unintelligible 00:51:35]. The [unintelligible 00:51:40] after that is that the place wasn’t insured and I think they were banking on me to be insured in order for them to capitalize on it. However, they were going to capitalize on it. Alexander: They wouldn’t capitalize on it, this is your property. They don’t own the property, they were simply a guest. I think probably what they were more concerned with was liability on their part. Actually, they did a right thing by bringing a plumber to fix the problem. They actually did the right thing by retaining a dry down company to come and extract the water. They did everything correctly if you think about it. They did you a favor by doing that. If your property is not insured, and this is what we’re getting at, that becomes an issue. Are you certain that your property is not insured? Charles: I am certain that the property is not insured. What happened was that the mortgage company on my statement [unintelligible 00:52:39] taxes and insurance? The reality was only taxes that they were paying because the HOA was paying the insurance but the HOA only covers the outside not the inside. Alexander: Well, you would be surprised. You’ve got to read the fine prints of the CCNRs. Those are the covenants, conditions and restrictions of the Condominium Associations. A lot of time when you pay insurance through your Condominium, the CCNRs will cover the interior damages, I’ve seen that many, many times. If you’d like, you can contact our office, we’d be happy to take a look at your CCNRs for you and determine if that claim has to go through your HOA insurance or not. Charles: Okay. I’ll look into that. But the bigger issue was that — Of course I investigated the heck out of all parties, the [unintelligible 00:53:29] guest, the ‘plumber’ and the company that extracted the water and they all know each other. They’re all in cahoots. This is a total scam and if there’s anyone out there that’s running the [unintelligible 00:53:43], they may want to be aware of this. Alexander: I would be happy to take a look at this in further detail for you and let you know if really that is the case or not. You’re more than welcomed to come to the office or call us for a free consultation and I’ll be happy to look into that for you. Lorraine: Yes that’s really interesting. Alexander: Absolutely, we’ll look into it for you. Alexander: Something doesn’t make sense as far as the guest is concerned in that. Because, again, they’re not the property owner so I don’t see an upside or benefit for them, for doing that. Maybe it was a vandalism, I don’t know, that could have lead into a water damage. Something went wrong [unintelligible 00:54:29]. We can take a look at that for them. Danny: Yes, I can’t believe it. We look forward to having everyone on board next week, Saturday at noon at the Acts Law Hour, A-C-T-S Law. Lorraine: Thanks so much for joining us today at A-C-T-S Law, the Acts Law Hour. Knowledge is power and power is knowledge. We hope we empowered you today. Thank so much to Alex Cohen for being our guest attorney. I really think a lot of people enjoyed that, so fun to have you back. A lot of people are calling in and loving it. Alexander: I enjoyed being here. Thank you. Lorraine: Thanks so much to our listeners because we couldn’t do it without you. I’m Lorraine Ladd, this is Danny Abir, and we hope you have a great weekend and remember to put your clocks back because it’s daylight savings time. Thanks so much. You’re listening to KABC.